The Bolingbrook Babbler: Chicago Skeptics shock the world by hosting largest Skepticamp ever! Chicago Skeptics shock the world by hosting largest Skepticamp ever! The Chicago Skeptics shocked both the paranormal and skeptical communities by hosting the largest Skepticamp in history. Skepticamps are local skeptical conventions that are organized by volunteers. Admission is free, though all participants were encouraged to donate either their time or money towards the event. Still, no other Skepticamp had come close to Chicago's 199 registered participants. 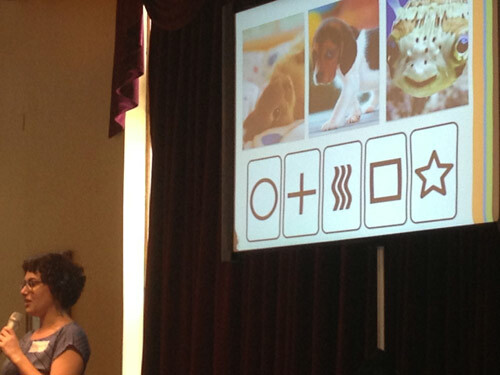 Dawn, president of the Chicago Paranormal and UFO Society, accused Chicago Skeptics using “mind control technology” to increase audience attendance. 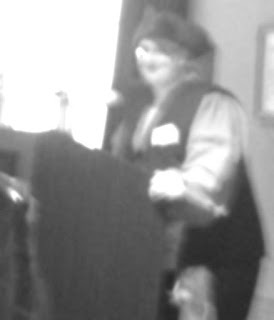 Chicago Skeptics member Jennifer, who asked that we not use her last name, denied the accusation. Reed Esau, the founder of Skepticamp, could not be reached for comment. 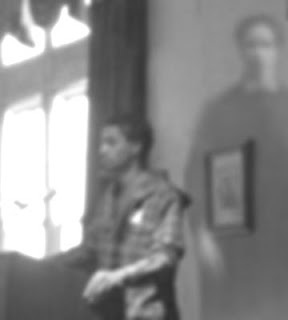 An attendee claims to have photographed a ghost during a presentation. “Marcus (Davis) was giving a cool talk on Bayesian probability, and I just had to take a picture.” Said the attendee who asked not to be identified. The attendee said that while Davis was the only person on stage, his picture showed another figure on stage. Like most buildings in Chicago, The Irish American Heritage Center is believed to be haunted. If confirmed, this could be the first picture of the ghost haunting the center. A pirate warned Skepticamp attendees about the global dangers of a declining pirate population. The alleged pirate showed a chart showing that a decrease in the global pirate population leads to an increase in global temperatures. The solution, he added, was for more people to become Pastafarian pirates. Famous Interstellar magician Dischum praised Chicago Skepticamp and its organizers. Dischum offers a billion dollar prize to anyone who can prove to him they have paranormal powers. Instead of applying for the prize, individuals who come to Dischum’s attention are abducted and forced to prove they have powers. Though Dischum, disguised as a human, did not give a presentation, he did make an undisclosed donation, and offered his praise to the organizers. Bonnie: I am not planning a coup!